Definition at line 316 of file Parser.cpp. Definition at line 319 of file Parser.cpp. Definition at line 323 of file Parser.cpp. Definition at line 327 of file Parser.cpp. 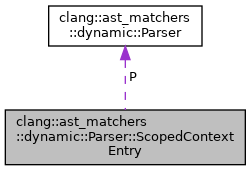 References clang::ast_matchers::dynamic::Diagnostics::Context::ConstructMatcher, clang::ast_matchers::dynamic::SourceRange::End, clang::ast_matchers::dynamic::VariantValue::getString(), clang::ast_matchers::dynamic::Parser::TokenInfo::ID_Bind, clang::ast_matchers::dynamic::VariantMatcher::isNull(), clang::ast_matchers::dynamic::VariantValue::isString(), clang::ast_matchers::dynamic::Parser::TokenInfo::Kind, clang::ast_matchers::dynamic::Diagnostics::Context::MatcherArg, clang::ast_matchers::dynamic::MatcherCompletion::MatcherDecl, nextArg(), clang::ast_matchers::dynamic::Parser::TokenInfo::Range, clang::ast_matchers::dynamic::VariantMatcher::SingleMatcher(), clang::ast_matchers::dynamic::MatcherCompletion::Specificity, llvm::str(), clang::ast_matchers::dynamic::ParserValue::Text, clang::ast_matchers::dynamic::Parser::TokenInfo::Text, clang::ast_matchers::dynamic::Parser::TokenInfo::TK_CloseParen, clang::ast_matchers::dynamic::Parser::TokenInfo::TK_CodeCompletion, clang::ast_matchers::dynamic::Parser::TokenInfo::TK_Comma, clang::ast_matchers::dynamic::Parser::TokenInfo::TK_Eof, clang::ast_matchers::dynamic::Parser::TokenInfo::TK_Error, clang::ast_matchers::dynamic::Parser::TokenInfo::TK_Ident, clang::ast_matchers::dynamic::Parser::TokenInfo::TK_InvalidChar, clang::ast_matchers::dynamic::Parser::TokenInfo::TK_Literal, clang::ast_matchers::dynamic::Parser::TokenInfo::TK_OpenParen, clang::ast_matchers::dynamic::Parser::TokenInfo::TK_Period, clang::ast_matchers::dynamic::MatcherCompletion::TypedText, and clang::ast_matchers::dynamic::Parser::TokenInfo::Value. Definition at line 317 of file Parser.cpp.